The Dispensary NV knows the love we and our customers have for pets. Find out how our stocked Therabis products can help them with everyday discomforts. Our 3 locations in Las Vegas, Reno & Henderson all stock Therabis. Come by or contact us to help you pick the right Therabis product for furry friend. Dogs have issues, too. They become stressed out, are itchy and may suffer from joint problems as they get older. With 25 years of research and experience, Therabis has created a formula to address the specific needs of your dog. Created with natural ingredients, you can be sure your dog is getting the relief they need. Therabis creator and veterinary expert, Dr. Stephen M. Katz, has spent a lifetime researching and developing this product after seeing so many clients highly concerned about their aging pets no longer able to follow their daily routines. When their pets had difficulty going up the stairs and jumping into bed, Dr. Katz became inspired to create something to alleviate chronic conditions in aging dogs. So what exactly is Therabis and what is in it? 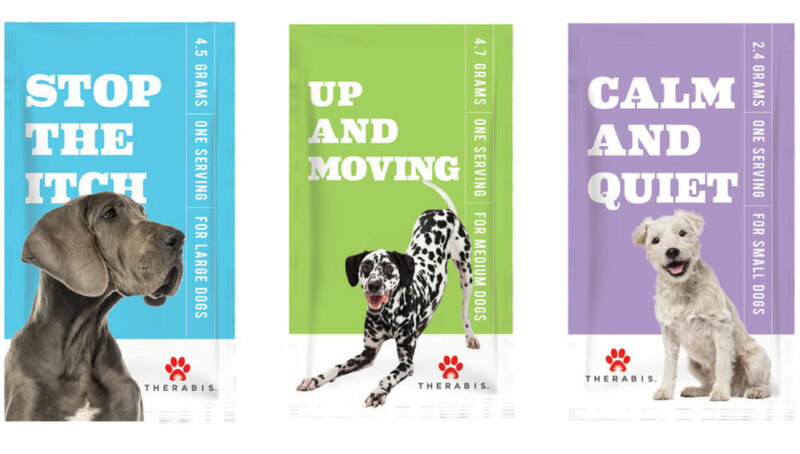 Therabis is a plant-based approach to helping aging dogs with chronic conditions (Up and Moving), itchy skin (Stop The Itch), and stress (Calm and Quiet). Research over the years has indicated that the compounds found in hemp have immense nutritional and therapeutic benefits and do not create the psychoactive effect provided by marijuana. Unlike marijuana, hemp indirectly affects the body’s cannabinoid receptors through alternative pathways. Therabis products come in various single-serving packs with appropriate serving sizes and doses for small, medium and large dogs. Calm and Quiet – for your four-legged friends who might be a little high-strung, anxious or need help calming down. Made with natural hemp oil, L-Theanine from green tea and natural flavoring, this combination is ideal for helping your pet deal with events such as stress, fireworks, and separation anxiety. Stop the Itch – for when the seasons change causing skin irritation, hot spots they can’t stop bothering and other skin allergies. By combining hemp oil, enzymes, bromelain, and quercetin, this formula reduces skin irritation and promotes healthy skin and hair for long-term effects. Up and Moving – for when their age starts to show in the form of joint immobility, hip dysplasia and back issues. The Up and Moving formula combines natural hemp oil, vitamin C, and green lipped mussel to keep your pet jumping on your bed and running up the stairs. Dr. Katz has spent years studying the ingredients and formulas to help create Therabis as a means to improve your pets life, naturally. The Dispensary NV is happy to have Therabis products for your pets at all three locations – Las Vegas, Henderson, and Reno.